Having recently signed to #UnMutePlus, SOUND AVTAR has been making monstrous waves in the Bass music scene! We have a chat with him about his latest release, Alarm Symphony and other stuff he’s upto! 1. Congratulations Piyush, on your latest release. Could you tell us more about your association with the label and Madoc? Thanks. Really stoked for my debut release on “The Pooty Club Records”. I’ve been in touch with the label owner Dave from quite sometime now. I find this label has unique sounds on their past releases and i’ve been been playing quite a lot of stuff from their catalog Me and Dave were constantly planning to put out a Sound Avtar 3 Track EP but due to my prior commitments it wasn’t possible so we instead agreed of putting up a single accompanying with a remix. I asked my very talented Dj/Producer friend Anuraag aka MADOC to do a remix and i think he aced it! 2.Tell us a little about your studio setup and the DAW/VST’s you use? I have a simple studio set up, it consists of a ‘Motu-Ultralite MK3’ audio interface, Mini-Mac, ‘KRK Rokit 5’ and ‘M Audio Bx8a Deluxe’, Novation Launchpad. Other than percussion and some music instruments which keep on going in and out of the studio, I produce on Ableton Live 8 and usually use my own self-synthesized sounds, software’s inbuilt Sound banks and instruments racks. 3. Which music producers are you digging at the moment? 5.You recently opened for Skream & Benga, what was that like? I couldn’t believe at first when i got to know that I’ll be opening for S & B, it was a career defining moment for me. The gig was hugely successful and brilliantly managed by Oji crew. Crowd response was totally amazing, i could see hordes of people loosing them-self on each drop. I can safely say that this was one of the best audiences i ever played for! 6. Finally, could you tell us a bit about what you are working on at the moment & any upcoming releases? 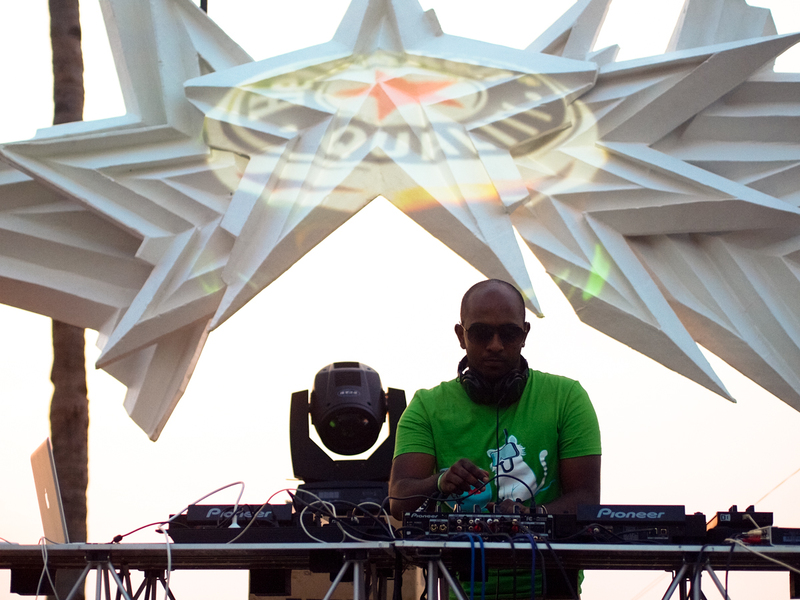 Praveen Achary kicks off 2013 with a BANG! With gigs across the country in 2012 and a new record label, JuiceBox coming up soon, the man is as busy as it gets. We chat with him about his latest release ‘Space Machine’ OUT NOW on RePlug – Support by – Guy J, Eelke Kleijn, King Unique, Hernan Cattaneo, Arjun Vagale and Marcelo Vasami among others! 1. 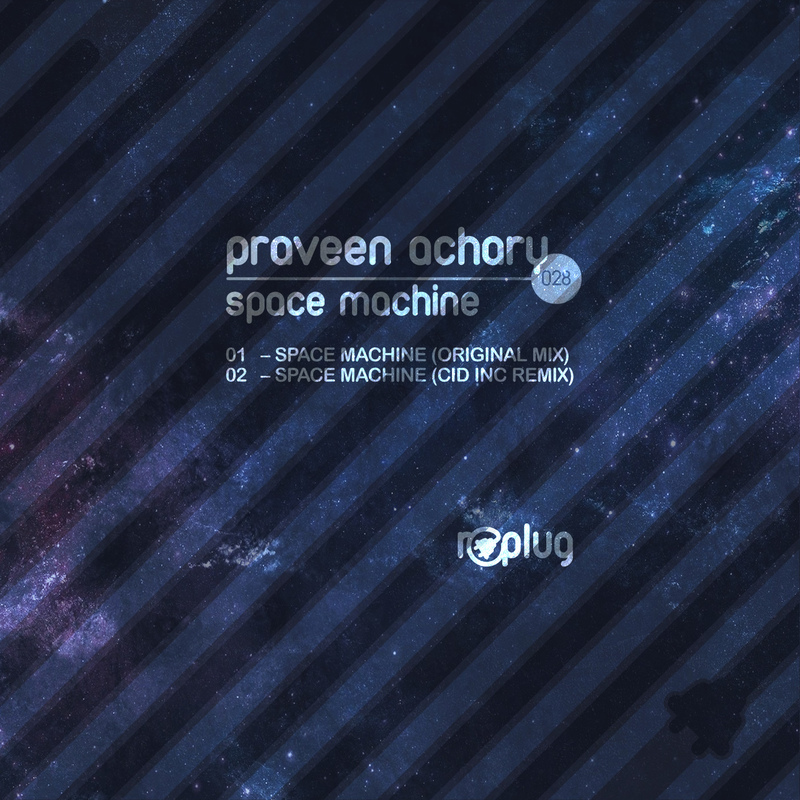 Congratulations on your newly released EP “Space Machine” on Replug Records. Tell us more about this release and your association with Henri (CID Inc)? Thank you! I am super happy about how it’s turned out and it is a great way to kick off 2013. I had posted a snippet of this track on SoundCloud a while back and Henri commented on it saying it was cool, so I finished it up straight away and sent it across. The rest, is the result and I couldn’t have been more happy :). The feedback has been pouring in left, right & center and it’s all been positive. I’ve been talking to Henri (Cid Inc.) for a few years now, especially after I started playing a lot more of his stuff, even back during his Mashtronic days. We had a connection and always had good laughs during our chats. He came down to India in 2012 for a tour with sLick! but unfortunately we couldn’t meet, but hopefully this year we’ll be doing something together in India soon. 2. What are your current favourite Record Labels? Bedrock, microCastle, Baires, Replug, Tronic. I’m lucky to be associated with two of these, hopefully will be all five sometime in the future. I really enjoy all the labels I’ve been associated with through the years (Mirabilis, MakTub, Outside The Box Music). 3. What is your current Studio setup like? Pretty mobile. It’s running off Ableton Live 8 (with a few favorite plugins & instruments) from a Macbook Pro with PreSonus Firebox & Samson Rubicons. Sometimes I just plug in my headphones instead and only use the monitors during mixing. I pull out the Novation ReMote SL keyboard once in a blue moon too. I’ve been using this setup for years and gotten used to the sound now, but I’m in the process of doing a complete revamp, with a couple of additions like the new Native Instruments Maschine and possibly a hardware synth. 4. We know the answer already, but what was your top gig in 2012? Almost every gig leaves me with something special to remember, but I must say that the sunset slot at Krank 2012 along with the B2B with Vipul at TLR Cafe in Delhi were rather special. 5. Finally, what’s coming up for you in the future in terms of releases? Also, tell us more about your fresh new imprint “Juicebox”. My remix for “Eelke Kleijn – Flierefluiter” is due out on his label: Outside The Box Music. Plus Vipul & I just finished up a collaborative remix of “D-Eye – Pulse” for Darin Epsilon’s label: Perspectives Digital. Our debut collab track is an original named “Future Echoes”, which will be the first release on my label: Juicebox Music. All these bits will be out in February 2013. I’ve got a couple more remixes coming out on various labels through the year and some originals that are doing the rounds and are looking for a home. Juicebox was announced in 2012 as an outlet for music that I’ve been pushing for years, but also is trying to tell the world that “Yes, we do listen & support it here in India as well”. The sound spectrum itself is quite wide, ranging from Deep House, Progressive to Techno, similar to what I play during my gigs & online sets (especially Juicebox on friskyRadio). There are plenty of other Indian artists doing great work and I want to give them a home-grown label they can be proud of and work with in the long run to build a better national scene. We’ve got signed music coming in from Indian artists like Vipul, Color Ray, AU, Tanseer (& more) along with international renowned artists like Santiago Garcia, Rikesto, Cactus Twisters and Rodrigo Mateo. We’ve got an even better future roster, but those names shall be revealed much later. It has taken some time to kick everything off, but I’d rather do it right than rush it. Ash Roy is on his way back from a massive 2 month Europe Tour! Here’s a video of him and Ashvin Mani Sharma playing at the FUSION FESTIVAL ! Ash’s latest release ‘Hourglass/beatbasket EP’ is OUT NOW on Kasey Taylor’s VAPOUR RECORDINGS! First of all Congratulations Ash on the release of your wicked new release – Hour Glass/Beat Basket on Vapour Recordings, tell us more about this EP? Thanks a lot. Well I produced this Ep a few months before I left for Berlin. The vibe I had in mind was Deep Tech House and that’s what I stuck to. Both the tracks have vocal samples flowing through to give it some funk. Hour Glass is a track that can be played in the middle of a set while Beat Basket can be a starter track. I sent both these tracks to Kasey Taylor, and Kasey immediately replied saying that he wanted to sign these to Vapour Recordings. What is the story behind both the track names? Well I thought of Hour Glass coz the track has a sample saying “ That first beat is right on time “ hence I called it Hour Glass. Initially I thought of calling Beat Basket “ Movin On “ but then I thought of Beat Basket coz it’s a very deep groovy track which I would only find in a basket full of beats. You’ve been on a crazy European Tour.. What was your best gig? Share a mad pic of one of your gigs from your phone! All my gigs this year have been spectacular from Fusion Festival to the Holi Open Air to Dresden to Oberhausen to Tresor to Mikz. Its been a wonderful tour. There is one Pic I would like to share which was just amazing. It’s the Belrin Holi Open Air organised by our friends. 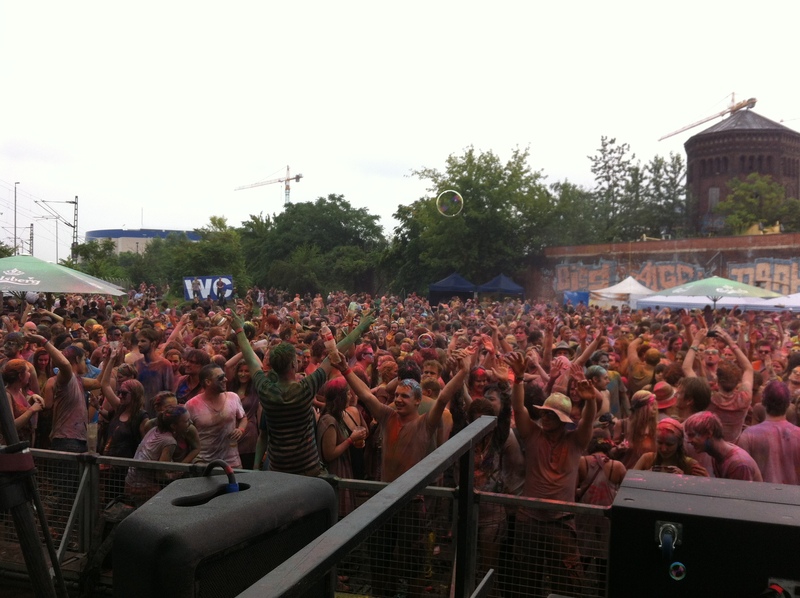 It just made my day when I saw the Berliners celebrating Holi like any other Indian. It was just epic! Who is your all time favourite DJ? In your opinion what city in India takes the music in the best? What city do you like playing in the most? Well the response is great in all the big cities but Mumbai tops them all. I like playing in Mumbai a lot. How did you separate yourself from any other DJs/Producers? What advice can you offer to someone young trying to create Techno music? I like to make my sets more interactive, so i play live percussion when I do a Dj set or a Live set. The advise I can give is that to believe in yourself and don’t try and copy other artist … be original. Finally, what’s coming next for you? Well a lot of releases to be out soon, and there is something I would like to share but I rather keep it a surprise. Wait for it 🙂 Also don’t forget to check out a collab I did with Ashvin & Shilpa Rao for the final episode of Coke studios this month (August 25th on MTV India). We’re also celebrating Ash’s release with a fun party at THE ZOO, New Delhi on August 25th! Click on the flyer below for event details! Collaborations, they say, are the future! After a successful release of “She Said”, Arjun Vagale teams up with Tim Richards a second time along with friends and long time collaborators Anil Chawla and Dale Anderson! The result is an aptly named COLLABORATIONS EP on Monique Speciale! We speak to Anil, Arjun and Dale about their track After 9! Monique Spéciale. Tell us more on how and where did this happen? Arjun Vagale: Thanks! We were basically booked to play a gig together in Delhi, sometime last year… it wasan ‘Our House’ night, so I invited Anil & Dale to come in a day early so we could hang out in my studio and see if some magic could happen, and it did! really were in the same city at the same time. between 3 people? Define how each of you contributed! us maybe 3 hrs to find a Kick drum, but the track just flowed after that and we pretty much finished it in a couple of hours. For me personally, I never get into the studio with a specific melody or groove, its always the vibe, and I think all three of us share that feeling that the vibe has to be correct. Dale: Surprisingly we all gelled together from a production standpoint very easily. We’ve all done collabs before, and sometimes they work and and sometimes they dont, but luckily we were all on the same page from the start. From a technical perspective, since it was Arjun’s studio we thought we’d let him man the Abelton controls (we were actually just being lazy though probably haha). But we all contributed to the arrangement and automation, the instrumentation, the hooks and the mixing pretty equally I’d say, although Anil did manage to squeeze in a little of his own voice in there! Were there any disagreements while making the track? Arjun: Yeah, I was fighting on the phone with someone about Josh Wink! Anil Chawla: Not at all… But when we ordered the pizza. That was a different matter! Any future plans on making more tracks together? Arjun: Yeah, this one was just a tester, but we will for sure do a full EP together. The only issue is, always, time. We all have super busy schedules, and we live in different city’s so that always tough. I would prefer do tracks with them physically present, rather than over the net, they’re just great guys to hang and work with. Anil: Definitely, we’ve been talking about a follow up for a while, it’s just a matter of getting us all together at the same time. Who’s your current favourite producer? Dale Anderson: Okain is up there for me, as well &Me and Alex Tepper. What are your top 5 – NON Electronic Dance Music tracks ever? iphone. Need to give the ears a rest as much as possible! But check out Mr G’s album, its dope. COLLABORATIONS is now available exclusively via Beatport HERE! 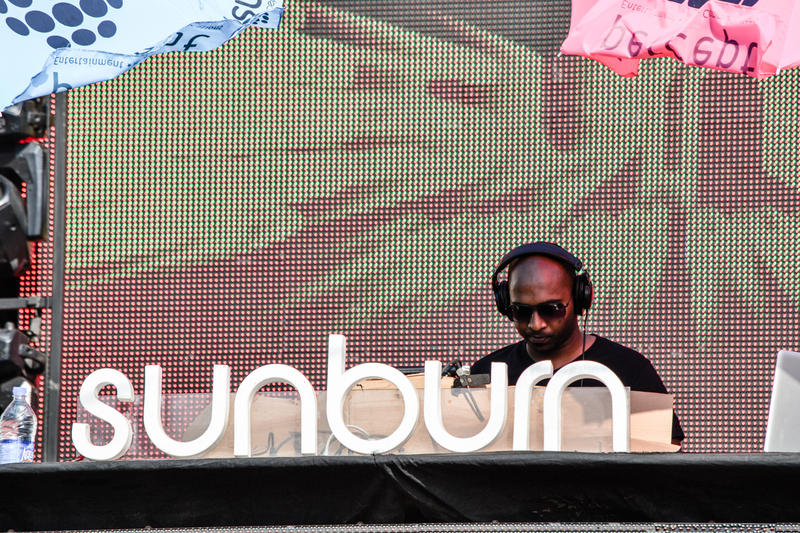 Arjun Vagale, Anil Chawla and Dale Anderson are exclusively represented by UnMute in India! Contact dev@unmute.in for more details! KOHRA has been making headlines lately all over the Indian Electronic Dance Music circuit! Securing the NUMBER 3 spot on the inaugural DJ MAG INDIA Top 10 (Industry poll), he has even come out with his own iphone and android app, courtesy SnapLion. Read more about that from this post HERE via the good people at WildCity ! We speak to the man himself about his latest release – DUST PARTICLE EP ! 1. Congratulations on your splendid release EP “Dust Particle” on Qilla Records! Tell us more about this release and your association with Jitter/Jayant and the Cactus twisters? A. Thanks! So basically the EP features my latest production “Dust Particle” which I have specially made for Qilla. The label’s philosophy is a lot about crossover music that spans over multiple genres, always keeping it fresh and interesting from the usual category of dance music that’s out there. As far as the remixes go, I asked Jayant (Jitter), because our musical understanding and styles are quite similar and I respect his productions a lot. Besides, he’s one of my oldest friends! The release also features a remix from “Cactus Twisters” who are a great upcoming duo from Belgium and have fast become good friends of mine. Our label supports their music a lot! 2. What’s in store for the future in terms of your releases and plans for Qilla? The future stores some very interesting and versatile releases from the label out of which I’d like to mention the two that I am most excited about. The BLOT! album, which spans over so many amazing styles of electronic music and is far ahead of it’s times. The album would work in a club as well as it would in your car on a lazy Sunday. Splendid. The second is the Jitter / Jayant Luthra artist album. All I cay say is that you’d better be prepared for an hour of the most futuristic dance music that’s out there!! Apart from these, will be our timely EP releases that cater to the open-minded and forward thinking Dj’s out there. 3. There’s also a free download on the EP? The official release features 2 remixes and the original, but we have an unofficial free download by Nikroma – who is a crossover tech-trance producer from San Diego, USA. He had been asking me to remix one of my tracks for a while and I sent over the parts, we really liked what he had done and decided to give it out for free as part of our 10th release! You can download it HERE ! 4. Your Fav VST-Plugin at the moment? A. Well, there are so many but I’m really enjoying using the Arturia ARP2600 currently. It’s not really a new plug-in but I’m kind of rediscovering it’s possibilities and it’s pretty wicked! 5. What’s your current studio setup? Give us a sneak-peak! L-R Mackie ProFX12, Akai MPK49, MiniMoog Voyager, YamahaHS80’s, Dave Smith Mopho, Motu828MK3, NovationRemoteZeroSL, Korg-Micro, iPad, Korg Monotron and a MacPro running Cubase/Ableton. 6. Your Top 5 tracks at the moment? DUST PARTICLE is NOW available on Beatport! 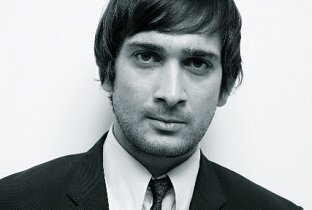 Notable television and film actor, Jimi Mistry (Rock N Rolla, 2012, The Guru, Blood Diamond among others) is a musician by heart! Jimi’s been involved in music for over 20 years and cites his influences from a broad range of musical styles, from HipHop and Funk/soul/disco to old skool Acid house and the deeper side of the dance spectrum. He has also been collecting records for over 20 years and DJ’d extensively from London to Ibiza and at various underground parties and festivals in Europe as well as celebrity hotspots like Cannes and Dubai! Introducing Jimi’s latest dj/producer moniker: mrmist , with a fantastic debut on Arjun Vagale’s Mak.Tub Music ! The compilation also features re-releases from Dale Anderson, Kini Rao, Jimmy Van M, Logistik Soundz among others! Congratulations on your 1st release as mrmist on Maktub Music! How did the connection with Arjun and the label happen? Why the transition from Hip Hop (with your moniker Lord Gravel) to Deep House? Well Hip Hop and Deep House are 2 of my main loves in music alongside disco & funk. In my teens it was all about old skool hip hop/breakin’/graf that sort of thing, I was growing up in Manchester in the north of England and it was everywhere and I loved it. Soon after came the Acid House explosion and the birth of rave. I was a raver and went to a lot over those years and used to follow DiY soundsystem throwing these crazy free parties around the country. It was a really special time as it was right at the beginning, we were the very few anywhere doing this sort of thing and even now it feels special to have been apart of that time. From there I started MCing @ raves and me and my mate at the time called ourselves the DJ Law and the MC order.hahaha makes me laugh now. Lord Gravel came much later and was a collaboration between myself and 2 producer friends, we were actually signed up by a major label but then they did what big labels do and sat on the tunes and eventually never released a thing, it was a blow and we kind of lost our momentum. mrmist is sort of a rebirth, for me anyway in my deep house guise. For a man who’s into mainstream cinema, writes music and DJs along with various other projects; what is your secret time management tool? It took me years to figure this out and in some ways I still don’t feel I’ve completely nailed it. Being into so many different things can be a real blessing but it can also be your downfall. Focus is my main problem sometimes, being able to think of one thing and work hard at it. I’m an easily distracted person but have learned to use my time wisely. I used to do a lot of promoting in London and ran a series of secret terrace parties called tabula rasa amongst other things. They were great times but I found myself not having much time for writing and planning my next acting job etc. This is when I started to plan my life in a more organized manner and it has paid off. If I’m away on an acting job then my laptop is my best friend, for writing music, communication and social media that sort of thing. I’ve found that I have become more adept at using my time wisely, after all time is a precious thing and is easily wasted. To keep writing music that people like. My big goal is to write an album and eventually start performing in a live capacity. Also I will be incorporating more vocals into my music and mix it up a little in style, try and surprise a few more people I think. Top 5 tracks that are in your set currently. There’s some great music out there at the moment, I never have any order of favourites really but here’s 5 that are doing it for me right now. Who is your all time DJ Hero? Wow well I suppose there are a couple of people that have inspired me. First is DJ POGO. Hip hop/funk/breaks DJ from the 80’s/90’s. One of the most amazing DJ’s I have seen and I was lucky that we became good friends. We did a lot of parties together, he now runs DMC in Brazil. DiY soundsysyem Dj’s, if it weren’t for them today’s scene wouldn’t exist. Period. Alfredo the Balearic Godfather, that inspired a generation. Follow mrmist on FACEBOOK and TWITTER for more updates! Anil Chawla is on a roll! He’s newest release titled “Bells” is out now on KD Music, the label owned by German Techno giants, Kaiserdisco who also feature on the EP on remix duties! Already Supported by: Luciano, Karotte, Mark & Nic Fanciulli, Slam, M.A.N.D.Y., Oxia, Christian Smith, Florian Meindl, Sasha, Shinedoe, Thomilla, Danny Serrano, SiS and many more. Anil is a stunning artist and producer from India. 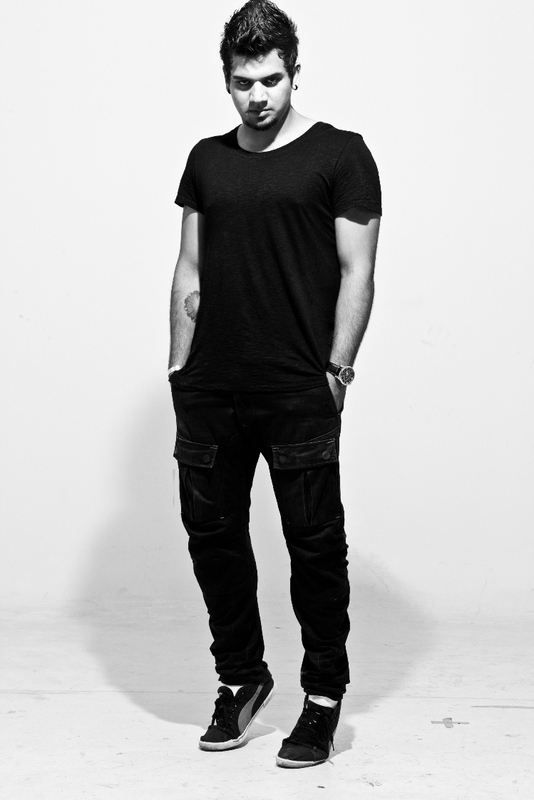 His talent has been recognised in multiple global dance music awards, including a nomination for DJMags Best Breakthrough DJ of 2008 in their Best Of British Awards, a Mixmag Future Hero spot, and an award for Best Deep House Track (for Leftorium with Dale Anderson). He was also shortlisted for Radio 1s In New DJs We Trust roster, a post narrowly missed out on and currently occupied by the likes of Heidi, Alex Metric and Toddla T. With Bells he presents you an outstanding super catchy tech-house summer tune! The remix is made once again by the label owners them self. They added a little melody to it and taking the summer vide one step higher. – Congratulations on such a great release on KD Music. Give us some insight on the Bells. Thank you! I’ve been speaking to the Kaiserdisco guys for a while now, and they do the A&R for another label, Takt, which I had a release on recently (Tandrum). We’ve stayed in touch about doing a release for them on their new imprint ‘KD Music’, and when I sent them ‘Bells’, they were really into it. To top it off, they decided to a remix of it themselves and put it out on vinyl, which was great! We’ve already scheduled a follow up for later in the year. It’s been getting some really good early support too, with plays from Luciano, Nic Fanciulli, Slam, M.A.N.D.Y, Christian Smith, Karotte, so I’m really happy how it’s been going so far. – What’s new in your studio setup? It’s a never ending learning process, and I’m still learning a lot as I go along, so I try not to take on too much software as it takes a while to become comfortable, so right now I’m sticking to what I know. I’m spending a fair bit of building up my sample library right now and organising it (a never ending process), as that’s currently my greatest resource when it comes to production. When me and Dale (Anderson) first started producing together, we always used a lot of samples (from the Cubase/PC days), then when I moved onto logic and mac about 5-6 years ago, everything was programmed using the ESX24. Now I guess it’s gone full circle, as I’m mainly doing the house/techno stuff but in Ableton this time (at least for building up a track), as it’s the best for getting loops together to get a groove going. 1 year ago, Mumbai. Right now, I have to say London. It’s really sad to see what’s happening with the nightlife there. When I first came to Mumbai, there was a buzz in the air, and you could almost feel the anticipation of a movement just waiting to happen (with regards to dance music). Alas, the buzz is no more. It’s like the government wants to make India this massively enticing and appealing place and and give cities like Mumbai international city recognition, but at the same time, it’s stunting its own growth by putting these plain ridiculous and stupid laws out there. The ministers need shaking. Everyone knows what the state of politics is in India, but at least now, from what I can see, the youth culture are starting to take note, speak out, and I really hope it makes a difference, and with any luck, these are the next generation of open minded people that are going to be in charge of the country. I’ll be back in September, and I really really hope it can turn around, and also hope there’s something I can do to help. – Who is your DJ Hero? Laurent Garnier. I used to watch him play at The End in London, when he used to spin for 8 hours straight, and he would give the perfect master class. I consider it art. He would usually start off with sublime deep house/techno and progress into the more heavy stuff, then out of nowhere, you’d get a classic disco track, then back into the heads down techno. An hour later, you’d get 4 or 5 drum and bass tracks, and the whole night would be mixed up between house/techno/rock/disco/d&b, but everything done so well. Really, anyone could throw of music together but he’s the only DJ I’ve ever seen that’s able to mix genres like that, seamlessly. – Your top 5 tracks of the moment? – What’s next for you in terms of releases etc? Aside from Bells and the follow up scheduled for November, I have a 3 track EP coming out on Arjun Vagale‘s label, Maktub. I’ve been wanting to do stuff with Arjun for quite a while, but schedule’s didn’t really permit, but it’s good that we’ve finally managed to get a 3 tracker together. The tracks are That’s More House, Fruitcake, and Nada. That’s more house has been receiving a fair few plays from Richie Hawtin lately, which is always nice. On the remix front, I’ve got 2 to do this summer whilst I’m back in London. One for Oliver Moldan on ‘Sounds R Us’ (a new subsidiary for Bonzai Records), and one for James Trystan on System Recordings. I’ve also got a stack of half finished tracks, which I need to finish off by the end of the summer. 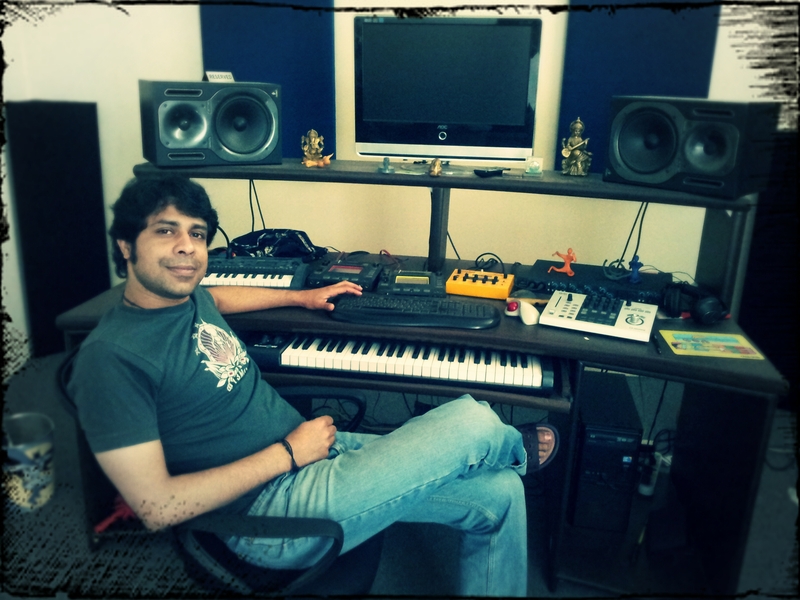 We chat with Ashvin Mani Sharma a.k.a Calm Chor on his latest album release – Tech Twist! Buy 'Tech Twist' off Beatport HERE! UnMute: Congratulations on such a fine release on Vertikal Records Give us some insight on Tech Twist, how and when was it produced, and the thought behind the tracks. AMS: Thanks guys… Well actually all this music was just lying around unreleased … All of these tracks have been played all over the world and tested on many dancefloors so i thought i should compile them into an album. Along with this another EP releases on Bass9 Records on the same day – ‘Keys To The Kingdom & Roundstone’. Click HERE to preview that! UnMute: How did you come to release on Vertikal Records? What’s your relationship with them and how did they hear of you? AMS: Actually, Ash Roy introduced me to them, and they liked the stuff I sent across. UnMute: What’s new in your studio setup? UnMute: Your top 5 tracks of the moment? Ashvin celebrates his album + ep launch this Sunday @ Cheri, New Delhi !